Android introduced BottomNavigationView in API 25.1 and I like it. To be honest, one of the biggest difference between iOS and Android for me was the placement of tabs. I enjoyed ActionBar tabs when they were a thing and loved the fact that I could swipe the tabs as I wished. But, when I used the bottom tabs in Android recently, I fell in love instantly. In today’s world of giant smartphones, one can only reach the bottom of the device during one-handed operations, so I loved the fact that I could use my hardware back button to navigate back and switch between tabs all with a single thumb. If you are building a Xamarin.Forms app, it should be a no-brainer that you use MVVM pattern for your code base. It should also be a no-brainer that you give Prism.Forms a try. It makes development fast and code easy to maintain with its plethora of built-in services such for navigation, dependency injection, alerts, events, etc. I recently added a sample to Prism’s samples library on how to use cross-platform EventAggregator using Prism.Forms in a Xamarin.Forms app. 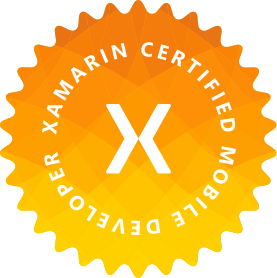 Get Xamarin Certified Now. For less. The most deterrent factor for anyone trying to get Xamarin certifiedhas been the upfront cost of enrolling in to Xamarin University. It used to be $1995/developer per year paid annually, which went down to $999 late 2016. This was a whopping 50% discount which garnered interest of many potential certification candidates. But let’s be honest, a grand is still very much out of question for a young developer who might still be in college or an experienced developer who just can’t afford that upfront, specially when some of other technical certification such as Microsoft’s are much cheaper. Sometimes in this beautiful world of cross-platform mobile development, we come across a problem that makes no sense at first. But after some StackOverflow surfing and Xamarin/MSDN research, we may find a way to tackle that problem. In some scenarios, there are multiple solutions and we have to decide which approach works best given our situation. In this post, I will demonstrate one of these problems, rather scenarios. The multi-tap monstrosity on Android when using Xamarin.Forms. I get asked this question a lot lately, thanks to Microsoft’s acquisition of Xamarin. Less than one month after Microsoft announced the Xamarin acquisition at Build 2016, interest in Xamarin went up 3 times. This is good for developers who want to play with Xamarin and build their mobile skill set using their .NET competencies, and those who want to switch to cross-platform mobile development from native side. Not to mention, the businesses that were not able to deliver their mobile apps in multiple platforms all at once due to cost and resources. Now they can with lower cost and in a lot of cases, with existing technical resources available, specially if they are a Microsoft shop.